Our new indoor water playground and spa building also has both men and women's bath / changing rooms attached! Plus a food serving area for groups and parties! Need a great place to hold a birthday Party? THIS IS IT!!!! Open May 15, 2009. Our New Kids Spray Water Park is Free to all our guests. (Your Kids will just love it! ), exclusively for our guests. 200 feet of sandy, private beach. Campfires on the Beach! One of few hotels in Mackinaw with ALL amenities on site! FREE Wireless Internet in Lobby & Breakfast Room. All Guestrooms have either King or Queen size beds. We have both Deluxe Beachfront & Economical Non-beachfront Rooms. All Rooms come standard with Refrigerator / Hair Dryers. 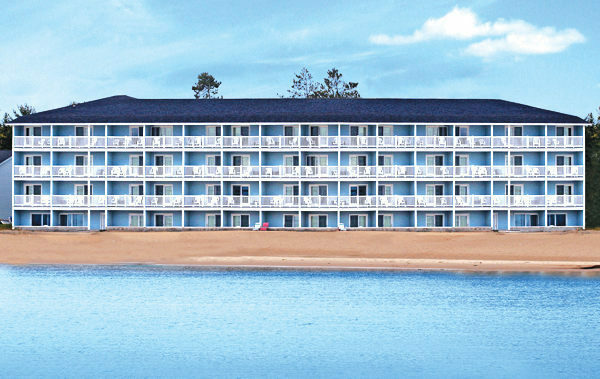 Lakefront Guestrooms have french door opening onto private balconies with views of the Island, and the bay. FREE, Expanded Continental Breakfast Features Fresh Hot Waffles! All rooms here are NON-SMOKING.